Today we started packing our bags. Now as you could have been reading in earlier articles, people started asking us WHAT we were going to take and especially HOW. As we did not really know the answer to those questions neither (except for some general ideas like “not too heavy” and “not too big”) we decided to put all the basic stuff we wanted to take together and have a look at the result. Then it is also very important to look at “personal stuff” each of us wanted to take: Vera being more of a sweet-ache, wishing to take Nutella, candy, chocolate and a bottle of Martinti and Jean-Christophe as a real French would not leave the country without a good bottle of wine, cheese and sausages (did anybody notice the presence of a laptop? Anybody still convinced that my boyfriend is not a geek?). 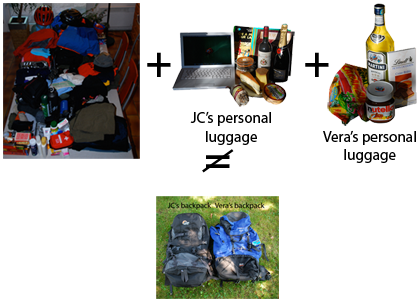 So if you make a simple count, you will quickly see that all this is not going to fit into our backpack. So we took things out in order to fit everything in. Result: 11 kg for each of us and a sparkle of hope that we might be able to find some good cheese and some Nutella in Russia. This entry was written by Vera and posted on July 27, 2007 at 22:53 and filed under Preparation, World Trip. Bookmark the permalink. Follow any comments here with the RSS feed for this post. Both comments and trackbacks are currently closed. just to show off, quoting Laozi in chinese. And, hey Mister Geek, haven’t think of a more portable device ? At least, Tweety, did you translated from English in Chinese, or did you just google it? One was an ultra tiny and light laptop from Sony. The problem was: it is not affordable. Just take te Jamboneau and eat it the first day with the bottle of wine? I asked for the original sentence from my soon to be wife. I am not reading Laozi in Chinese! So at least I can learn something. If I had google it, it would have just been a simple copy/paste. About portable device : HTC does some very nice stuff. combine phone/computer and foldable keyboard. Cheaper than a Vaio, and replace you cellphone as well. Well, anyway, too late now ! You’ll have to carry your (there is 2 people behind this ‘your’ ok ?) laptop around the world. @Thierry: Cellphone??? On a worldtrip??? No, no, no, no, noooo!!!! And then I think you did not understand quite right what JC explained you above. We are taking a PDA (a Palm) with a foldable keyboard in order to keep track of what we are doing (our travel memoires if you like). So not very big and not very heavy. No laptop! Oups, my mistake. True, true, I didn’t get the palm story as the retained option. But reading the post again, it was perfectly clear in fact. So traveling super light anyway ! I hope there was still enough space in your bag to take along the Martini. You know… this stuff is essential! Could not enlarge the map, but remember that from South China, if you pass though Laos, you may arrive in Luang Namtha, where there is our communication base, and which is about 3 hours drive from where I work (Muang Long, heart of gold triangle). I will be here until mid-October, so you are welcome anytime, the house is nice and big, the beer is good and it is difficult to a more remote and typical place in south east asia than Muang Long (maximum 10 tourists in one year). As we have no power supply in Long, if you pass to namtha, you can ask for ACF office, or better call me 0205 08 69 56.